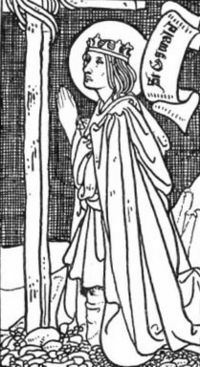 Oswald in The Little Lives of the Saints, illustrated by Charles Robinson in 1904. Oswald (ca. 604–August 5, 642 C.E.) was King of Northumbria from 634 until his death, and was subsequently venerated as a Christian saint. He was the son of Aethelfrith of Bernicia, though he was denied his inheritance and forced into exile by his father's untimely death at the hands of Redwald, King of the East Angles. After maturing to adulthood, the young king amassed a small army and mounted a campaign against his homeland, eventually coming to unify Bernicia and Deira into a single Northumbrian kingdom. From a religious standpoint, he was noted for both his pious charity and his vociferous promotion of Christianity—tasks he undertook alongside the venerable Saint Aidan. After eight years of rule, during which time he was the most powerful monarch in Britain, Oswald was killed in the battle of Maserfield. Oswald's assessment in Bede's Ecclesiastical History of the English Nation, which was written less than a century after the king's death, was profoundly positive, as the noted chronicler viewed him as a saintly king. This detailed narrative portrait remains useful today, as it provides the primary source for present-day historical knowledge of Oswald. Oswald's father, Aethelfrith, was a successful Bernician ruler who, through canny political and military maneuvering, also became king of Deira, and was thus the first to rule both of the kingdoms that eventually constituted Northumbria (Bernicia in the north and Deira in the south); it would, however, be anachronistic to refer to a "Northumbrian" people or identity at this early stage, as the Bernicians and the Deirans were still clearly distinct peoples. Oswald's mother, Acha, was a member of the Deiran royal line, who Aethelfrith apparently married as either part of his acquisition of Deira or his consolidation of power there. Oswald was apparently born in or around the year 604, since Bede says that he was killed at the age of 38 in 642. This date is corroborated by the fact that Aethelfrith's acquisition of Deira was also believed to have occurred around 604. Aethelfrith's years as a successful warlord came to an abrupt end in 616, when he was slaughtered by Redwald of East Anglia at the River Idle. This defeat allowed an exiled member of the Deiran royal line, Edwin of Northumbria (Acha's brother), to usurp the throne and become king of Northumbria, which, in turn, forced Oswald and his brothers to flee to the north. As such, the young princes spent the remainder of their youths in the Irish kingdom of Dál Riata in northern Britain. At this time, Oswald was educated at Saint Columba's monastery in Iona, where he was converted to Christianity. In addition to obtaining an education, he may also have fought in Ireland's wars with the Picts during his years in exile. Oswald, being about to engage, erected the sign of the holy cross, and on his knees prayed to God that he would assist his worshipers in their great distress. It is further reported, that the cross being made in haste, and the hole dug in which it was to be fixed, the king himself, full of faith, laid hold of it and held it with both his hands, till it was set fast by throwing in the earth and this done, raising his voice, he cried to his army, "Let us all kneel, and jointly beseech the true and living God Almighty, in his mercy, to defend us from the haughty and fierce enemy; for He knows that we have undertaken a just war for the safety of our nation." All did as he had commanded, and accordingly advancing towards the enemy with the first dawn of day, they obtained the victory, as their faith deserved. Be strong and act manfully. Behold, I will be with thee. This coming night go out from your camp into battle, for the Lord has granted me that at this time your foes shall be put to flight and Cadwallon your enemy shall be delivered into your hands and you shall return victorious after battle and reign happily. Oswald described his vision to his council and all agreed that they would be baptized and accept Christianity after the battle. As mentioned above, the British were routed in the ensuing conflict in spite of their superior numbers; Cadwallon himself was killed. A map showing the general locations of the Anglo-Saxon peoples around the year 600 C.E. Following the victory at Heavenfield, Oswald reunited Northumbria and re-established the Bernician supremacy which had been interrupted by Edwin. Bede says that Oswald held imperium for the eight years of his rule, during which time he was the most powerful king in Britain. Commemorating his expansive influence, the ninth-century Anglo-Saxon Chronicle describes Oswald as a Bretwalda (an overlord controlling multiple Anglo-Saxon kingdoms) and Adomnán states that he was "ordained by God as Emperor of all Britain". While Oswald seems to have been widely recognized as overlord, the true extent of his authority is uncertain—an issue that is complicated by somewhat contradictory accounts of the period. For instance, Bede makes the claim that Oswald "brought under his dominion all the nations and provinces of Britain", which, as the chronicler notes, was divided by language between the English, British, Scots, and Picts; however, he also seems to undermine his own claim when he states that it was Oswald's brother Oswiu who made tributary the Picts and Scots. An Irish source, the Annals of Tigernach, records that the Anglo-Saxons banded together against Oswald early in his reign; this may indicate an attempt to put an end to Oswald's overlordship south of the Humber, which presumably failed. 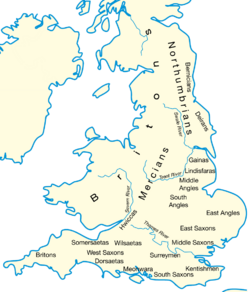 The Mercians, who participated in Edwin's defeat in 633, seem to have presented an obstacle to Oswald's authority south of the Humber, although it has been generally thought that Oswald dominated Mercia to some degree after the battle of Heavenfield. It may have been to appease Oswald that Penda had Eadfrith, a captured son of Edwin (and thus a dynastic rival of Oswald), killed, although it is also possible that Penda had his own motives for the killing. Further, Oswald apparently controlled Lindsey, as evidenced by Bede's account of the translation of the saint-king's bones to a monastery there. In it, the historian says that the monks initially rejected the relics because Oswald had ruled over them as a foreign king (see below). To the north, it may also have been Oswald who conquered the Gododdin. Irish annals record the siege of Edinburgh, thought to have been the royal stronghold of the Gododdin, in 638, and this seems to mark the end of the kingdom; that this siege was undertaken by Oswald is suggested by the apparent control of the area by his brother Oswiu in the 650s. Oswald seems to have been on good terms with the West Saxons, as he stood as sponsor to the baptism of their king, Cynegils, and married Cynegils' daughter. Her name is reported by only one source, Reginald of Durham's twelfth century Vita S. Oswaldi, which says that it was Kyneburga. Although Oswald had one known son, Aethelwald of Deira, it is uncertain whether this was a son from his marriage to Cynegils' daughter or from an earlier relationship—since Aethelwald began ruling in Deira in 651, it has been argued that a son from this marriage would have been too young at the time to be trusted with this position, and therefore may have been older, the product of a relationship Oswald had during his exile. Although Edwin had previously converted to Christianity in 627, it was Oswald who truly began the task of disseminating the faith among the Northumbrians. Shortly after becoming king, he asked the Irish of Dál Riata (specifically the monastery of Iona, the location of his youthful exile) to send a bishop to facilitate the conversion of his people. Initially, the Irish sent Cormac, an austere and unlikable missionary whose comportment and style of preaching utterly failed to impress the Anglo-Saxons. When he returned in failure, the monastery then sent Aidan, a pleasant and youthful monk whose gentler approach, especially when coupled with his personal generosity and piety, proved substantially more successful. Oswald gave the island of Lindisfarne to Aidan as his episcopal see, which provided a locus for his newly-founded abbey's missionary activities. Intriguingly, Bede mentions that Oswald acted as Aidan's interpreter during the early years of the monk's preaching, as Aidan did not know English well and Oswald had learned Irish during his exile. Bede's account was clearly formulated to emphasize Oswald's saintly character. Although he could be (and often is) interpreted as a martyr for his subsequent death in battle, Bede portrays Oswald's sainthood as arising from his deeds in life—indeed, it has been noted that Bede never uses the word "martyr" in reference to Oswald. In this respect, as a king regarded as saintly for his life while ruling—in contrast to a king who gives up the kingship in favor of religious life, or who is venerated because of the manner of his death—Bede's portrayal of Oswald stands out as unusual. The chronicler takes great pains to demonstrate Oswald's generosity to the poor and to strangers, telling several stories to highlight this characteristic. In one, Oswald is described sitting down at an Easter meal with Aidan, when a servant, whom Oswald "had appointed to relieve the poor," came in and told Oswald that a crowd of the poor were in the streets begging alms from the king. In response, the king immediately had his food given to the poor, and even had a large dish of dainties broken up and distributed. Aidan was greatly impressed and seized Oswald's right hand, stating: "May this hand never perish." Accordingly, Bede reports that the hand and arm remained uncorrupted after Oswald's death. It was a conflict with the pagan Mercians under Penda that proved to be Oswald's undoing, falling to their forces at the Battle of Maserfield in 642. Bede completes his account of the king's life by suggesting that Oswald "ended his life in prayer," beseeching god on behalf of the soldiers who had fallen alongside him. After the great king's death, the pagan victors ordered that his body be mutilated, dismembered and publicly displayed in honor of Woden. The ultimate fate of his material remains is described below. The traditional identification of the battle site with Oswestry, which was probably in the territory of Powys at the time, suggests that Penda may have had British allies in this battle. This hypothesis is also suggested by surviving Welsh poetry that has been thought to indicate the participation of the men of Powys in the battle. As a result, some scholars have noted that, if the traditional identification of the site as Oswestry is correct, Oswald was on the offensive, fighting in the territory of his enemies. This could conflict with Bede's saintly portrayal of Oswald, since an aggressive war could hardly qualify as a just and pious course of action—a fact that perhaps explains why Bede is silent on the cause of the war. Oswald may have had an ally in Penda's brother Eowa, who was also killed in the battle, according to the Historia Britonnum and Annales Cambriae; while the source only mentions that Eowa was killed, not the side on which he fought, it has been speculated that Eowa was subject to Oswald and fighting alongside him in the battle, in opposition to Penda. After his death, a cult soon developed around Oswald's sainted persona, with the most notable development being the notion that his mortal remains had miraculously curative properties. For instance, Bede notes that the spot where the king died came to be associated with magical cures—a belief that was sufficiently prevalent that people continued taking dirt from the site until a hole was dug as deep as a man's height. Likewise, Bede also describes a miracle striking a monastery in Lindsey that refused to house his remains. In this account, a pillar of light is said to have appeared over the wagon in which the bones were being carried, shining up to the sky. This prompted the formerly recalcitrant monks to accept them into the monastery: "in the morning, the brethren who had refused it the day before, began themselves earnestly to pray that those holy relics, so beloved by God, might be deposited among them." Reginald of Durham recounts another miracle, saying that his right arm was taken by a bird (perhaps a raven) to an ash tree, which gave the tree ageless vigor; when the bird dropped the arm onto the ground, a spring emerged from the ground. Both the tree and the spring were, according to Reginald, subsequently associated with healing miracles. Further, his arm (which had been blessed by Saint Aidan) was thought to be utterly indestructible, never succumbing to putrefaction. Aspects of these legends seem to have pagan overtones or influences, as they represent a fusion of the traditional Germanic warrior-king with Christianity sainthood. Given the breadth of his influence, it is not surprising that Oswald's cult came to be highly influential throughout the British kingdom. As testament to this, the king's relics came to be transmitted throughout the country in the years following his death, likely due to their reputation for sanctity. Specifically, his bones resided either at Lindsey in what became Viking Northumbria, or Bamburgh. But in an exploratory five-week attack on Lindsey in 909 by the Mercian king, Oswald's remains were captured and taken away for reburial at Gloucester. Oswald's head was interred in Durham Cathedral together with the remains of Cuthbert of Lindisfarne (a saint with whom Oswald became posthumously associated) and other valuables in a quickly made coffin, where it is generally believed to remain, although there are at least four other ostensible "heads of Oswald" in continental Europe. His feast day, which is celebrated on August 5th, has been "kept since the late seventh century." The saint's lasting import is well summarized by Farmer, who notes that "His cult eventually extended to Scotland, Ireland, Portugal, Bohemia, Holland, Germany, Austria, and Switzerland. He was remembered as one of England's national heroes; his bravery and military skill, his generosity and piety, together with a sacrificial death in battle for country and faith, combined Anglo-Saxon hero and Christian saint." ↑ 1.0 1.1 While Bede gives the year of Oswald's death as 642, there is some question as to whether Bede's reckoning of years is compatible with our own. R. L. Poole (Studies in Chronology and History, 1934) put forward the theory that Bede's years began in September, and if this theory is followed (as it was, for instance, by Frank Stenton in his notable history Anglo-Saxon England (1943)), then the date of the battle of Heavenfield (and the beginning of Oswald's reign) is pushed back from 634 to 633. Thus, if Oswald subsequently reigned for eight years, he would have actually been killed in 641. Poole's theory has been contested, however, and arguments have been made that Bede began his year on December 25 or January 1, in which case Bede's years would be accurate as he gives them. ↑ Clare Stancliffe and Eric Cambridge, (eds.) Oswald: Northumbrian King to European Saint. (Stamford: Paul Watkins, 1995), 36. ↑ D.P. Kirby. The Earliest English Kings. (London and New York: Routledge Publishers, 2000), 60. ↑ 4.0 4.1 Bede, Historia Ecclesiastica, Book III, chapter 9. ↑ 6.0 6.1 6.2 Bede, Book III, chapter 1. ↑ Or possibly 632, depending on Bede's chronology (see note #1 (above)). ↑ 9.0 9.1 Michelle Ziegler, "The Politics of Exile in Early Northumbria", The Heroic Age 2 (Autumn/Winter 1999). ↑ Bede, Book III, chapter 2. ↑ Quoting the Book of Joshua, 1:9. ↑ Adomnán of Iona. Life of St Columba, Translated and Edited by Richard Sharpe. (London: Penguin, 1995), Book I, Chapter 1. ↑ S. Baring-Gould. The Lives of the Saints, With introduction and additional Lives of English martyrs, Cornish, Scottish, and Welsh saints, and a full index to the entire work. (Edinburgh: J. Grant, 1914), 66-67. ↑ Both Bede and the Anglo-Saxon Chronicle (somewhat arbitrarily) suggest that Oswald's reign should actually reckoned as encompassing nine years, with the ninth year being accounted for by crediting to Oswald the year preceding his rule, "on account of the heathenism practised by those who had ruled that one year between him and Edwin" (The Anglo-Saxon Chronicle, manuscript E, year 634). See also: Bede, Book III, chapter 1. ↑ Simon Keynes, "Bretwalda", in The Blackwell Encyclopaedia of Anglo-Saxon England, ed. Michael Lapidge et al., (Oxford, UK: Blackwell, 1999). It is suggested that the term could be linguistically derived from the phrase "Lord over Britain" (or perhaps "Great Lord"), as walda is an Anglo-Saxon term for "ruler" (as per Brewer's The Reader's Handbook)bibliomania.com. Retrieved November 14, 2008..
↑ Adomnán, Book I, chapter I. ↑ For the mention of Oswald's power over Britain, see Book III, chapter 6 of Bede's Ecclesiastical History. For the mention of Oswiu making the Scots and Picts tributary, see Bede, Book II, chapter 5. ↑ See: Kirby, 70, for a discussion of how this indicates that Bede was defining Oswald's supremacy in excessive terms. ↑ Stancliffe, "Oswald", 60. According to Stancliffe, "Oswald would scarcely have been remembered as an effective overlord in so many Southhumbrian kingdoms if his power had been checked this early in his career." The report is given under the year 637 in the Annals of Tigernach. ↑ Stancliffe, "Oswald", 54, 71–75. Stancliffe mentions Penda's possible reasons for independently having Eadfrith killed, and expresses doubt that Bede would have regarded Oswald as such a saintly figure if he had known Oswald was responsible for Eadfrith's death. ↑ Bede, Book III, chapter 7. ↑ Victoria Tudor, "Reginald's Life of St Oswald" in Stancliffe and Cambridge's Oswald: Northumbrian King to European Saint, 187, note 57. ↑ Alban Butler. Lives of the Saints, Edited, revised, and supplemented by Herbert Thurston and Donald Attwater. (London: Palm Publishers, 1956), 398. ↑ Bede, Book III, chapter 6.;Retold in Hole, 110-112. ↑ The location of this conflict is generally identified with Oswestry, although other candidates for the location of the battle have been suggested, as in Clare Stancliffe's "Where Was Oswald Killed?" (in Stancliffe and Cambridge's Oswald: Northumbrian King to European Saint. (1995). ↑ For Bede's mention of Oswald's dying prayer (which he cautiously reports as hearsay) and Oswald's dismemberment, the placing of his body parts on stakes, and their later recovery by Oswiu, see his Ecclesiastical History, Book III, chapter 12. ↑ Specifically, Bede says only that Oswald died "fighting for his fatherland." He also fails to mention other offensive warfare that Oswald is presumed to have engaged in between Heavenfield and Maserfield. See: Stancliffe, "Where Was Oswald Killed?" which argues in favor of the traditional identification of the site with Oswestry. For Stancliffe's argument regarding Bede's portrayal of Oswald as fighting only just wars, achieved through the omission of certain battles and the re-characterization of existing conflicts (such as the chronicler's attempt to portray Maserfield as part of a just war (being fought pro patria)) (93). ↑ Nicholas Brooks. "The Formation of the Mercian Kingdom" in The Origins of Anglo-Saxon Kingdoms, Edited by Steven Bassett. (Leicester: Leicester University Press, 1989). ↑ Bede, Book III, chapter 11. ↑ 36.0 36.1 David Rollason, "St Oswald in Post-Conquest England," in Stancliffe and Cambridge's Oswald: Northumbrian King to European Saint, 170. ↑ Richard N. Bailey, "St Oswald's Heads", in C. Stancliffe and E. Cambridge, (eds.) Oswald: Northumbrian King to European Saint. ↑ David Hugh Farmer. The Oxford Dictionary of Saints. (Oxford; New York: Oxford University Press, 1997), 379-380, notes that Oswald's relics seem to have multiplied in the years following his death, with a bare minimum of two heads, four arms, and one entire body being claimed by various European churches. Adomnan of Iona. Life of St Columba, Translated and Edited by Richard Sharpe. London: Penguin, 1995. ISBN 0140444629. Accessible online at the Fordham University's Medieval Sourcebook. Baring-Gould, S. (Sabine). The Lives of the Saints, With introduction and additional Lives of English martyrs, Cornish, Scottish, and Welsh saints, and a full index to the entire work. (16 vols) Edinburgh: J. Grant, 1914. Full text online .archive.org. Retrieved November 14, 2008. The Venerable Bede. The Ecclesiastical History of the English Nation, Translated by L.C. Jane. London: J.M. Dent; New York E.P. Dutton, 1910. Accessed online at: Fordham University's Medieval Sourcebook. Bailey, Richard N. "St. Oswald's Heads" in Stancliffe and Cambridge's Oswald: Northumbrian King to European Saint. Brooks, Nicholas. "The Formation of the Mercian Kingdom" in The Origins of Anglo-Saxon Kingdoms, Edited by Steven Bassett. Leicester: Leicester University Press, 1989. ISBN 0718513177. Hole, Christina. Saints in Folklore. London: G. Bell and Sons, 1966. Poole, R. L. Studies in Chronology and History. 1934. Rollason, David. "St Oswald in Post-Conquest England" in Stancliffe and Cambridge's Oswald: Northumbrian King to European Saint. Parker, S. Anselm. "Saint Oswald" in the Catholic Encyclopedia. 1911. newadvent.org. Stancliffe, Clare and Eric Cambridge, eds. Oswald: Northumbrian King to European Saint. Stamford: Paul Watkins, 1995. ISBN 1871615518. Stancliffe, Clare. "Oswald, 'Most Holy and Most Victorious King of the Northumbrians'" in Stancliffe and Cambridge's Oswald: Northumbrian King to European Saint. Stancliffe, Clare. "Where Was Oswald Killed?" in Stancliffe and Cambridge's Oswald: Northumbrian King to European Saint..
Ziegler, Michelle, "The Politics of Exile in Early Northumbria", The Heroic Age 2 (Autumn/Winter 1999). This page was last modified on 7 August 2015, at 19:19.